Phosphodiesterases (PDEs) have gained attention as potential pharmacological targets for neuropsychiatric diseases due to their ability to hydrolyze the second messengers, cGMP and/or cAMP. It is well-known the relationship between cAMP signaling and inflammation. Since neuroinflammation is considered to play an important role in the pathology of brain disorders, inhibition of PDEs highly expressed in brain has emerged as an innovative strategy for the treatment of these pathologies. 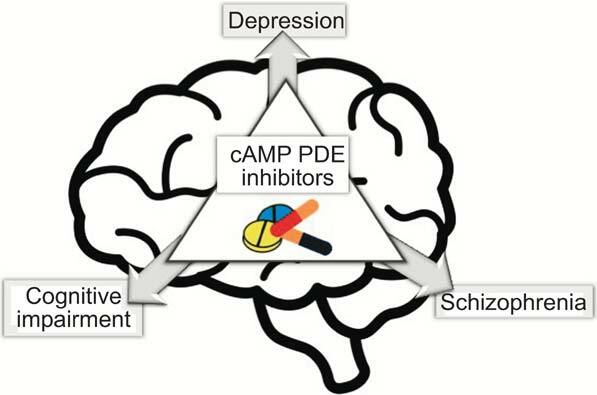 PDE4, 7, 8 and 10 inhibitors are presented here as promising drug candidates to overcome the partial efficacy and adverse effects of the current therapy for neuropsychiatric illness such as depression, cognitive impairments or schizophrenia. Enhancing the intracellular concentration of cAMP underlies the effects of PDE inhibitors in the above mentioned disorders. cAMP, Cognitive Impairment, Depression, Phosphodiesterase, inhibitors, Schizophrenia. Centro de Investigaciones Biológicas (CSIC), Ramiro de Maeztu 9, 28040 Madrid, Spain.